Local history note on Mary Elizabeth Braddon. One of the most popular and prolific novelists of her day and the virtual founder of a new school of "sensational" fiction, Miss Mary Elizabeth Braddon was born at number 2 Frith Street, Soho Square, London on 4 October 1835. Her father, Henry, a solicitor by profession, wrote several books on sporting subjects and also contributed articles (under the pseudonym of "Rough Robin") to the Sporting Magazine. Miss Braddon was educated privately in England and France and showed an eagerness to write at an early age. In about 1856, while she was living at Beverley in Yorkshire, she was offered a commission by a local printer to produce a serial novel "combining the humour of Dickens with the plot and construction of G.P.R. Reynolds." The result was Three times dead, or The Secret of the Heath which, however, ceased running after only a few instalments, the printer having become bankrupt. Later the author re-wrote the novel and it was eventually published in 1861 under the title The Trail of the Serpent. In 1862, Miss Braddon’s best known novel Lady Audley’s Secret began serialisation in the magazine Robin Goodfellow and, after that periodical had ceased publication, it was continued in The Sixpenny Magazine. Later in 1862 it appeared as a "three-decker" and scored an immediate success. Many novels and plays followed from the pen of this indefatigable writer. Miss Braddon was a regular contributor to Punch and The World and she even produced a serial story in French, which was published in the Paris Figaro. She wrote the greater part of numerous Christmas annuals (such as The Mistletoe Bough) and was the editor of several magazines, notably Temple Bar and Belgravia. In 1874, after the death of his first wife, she married the publisher John Maxwell (died 1895). She and Maxwell had, in fact, been living together for some years at his Richmond home, Lichfield House in Sheen Road, and they had five surviving children born between 1862 and 1870. A son born in 1866 was later to become the novelist William Babington Maxwell (died 1938). Maxwell also had five children from his first marriage who stayed with the couple during the holidays. Although the family spent a great deal of time at their country house, at Annesley Bank near Lyndhurst in Hampshire, Richmond was to remain their permanent home. At Lichfield House Miss Braddon was surrounded by a wide variety of ornaments, pictures, books and bric-a-brac, not to mention the manuscripts of her novels which were bound in crimson leather. Her husband invested in property in the King’s Road area of Richmond and named certain roads after characters in her novels. These included Marchmont Road (after John Marchmont in John Marchmont’s Legacy) and Audley Road. Braddon Road was built in the 1930s on part of the Selwyn estate. Miss Braddon was an accomplished horsewoman and one of her greatest pleasures was to go riding in Richmond Park. She died at Lichfield House on 4 February 1915 and was buried at Richmond Cemetery. A bronze wall memorial plaque in Richmond Parish Church was unveiled in the same year. 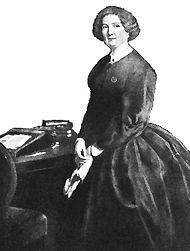 Mary Elizabeth Braddon. Black and white illustration.